Views from Sage Hill Inn: Grand Opening for "150 Market" Farmers Market in Kyle, Texas. Grand Opening for "150 Market" Farmers Market in Kyle, Texas. We're very excited to announce that the grand opening of the 150 Market farmers market has finally arrived. The local farmers market was the brainchild of Sharon Michaelis (seen above) and takes place on the Michaelis Ranch, 25 miles south of Austin, Texas on FM 150 and is just down the road from the Inn Above Onion Creek. The 150 Market features dozens of vendors that are offering locally grown produce, fresh eggs and even beef raised right on the Michaelis Ranch. 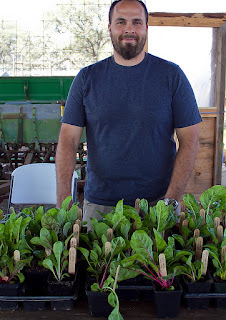 Brian Bayer is one of the many local vendors featured at the 150 market (seen here with some fresh lettuce that was grown about 20 feet from where the photo was taken). Brian and our very own Chef Galvan have been friends for years, such good friends that Chef was a groomsman at Brian's wedding. Brian is currently a student at Texas State majoring in horticulture and tends to a garden on the Michaelis Ranch. 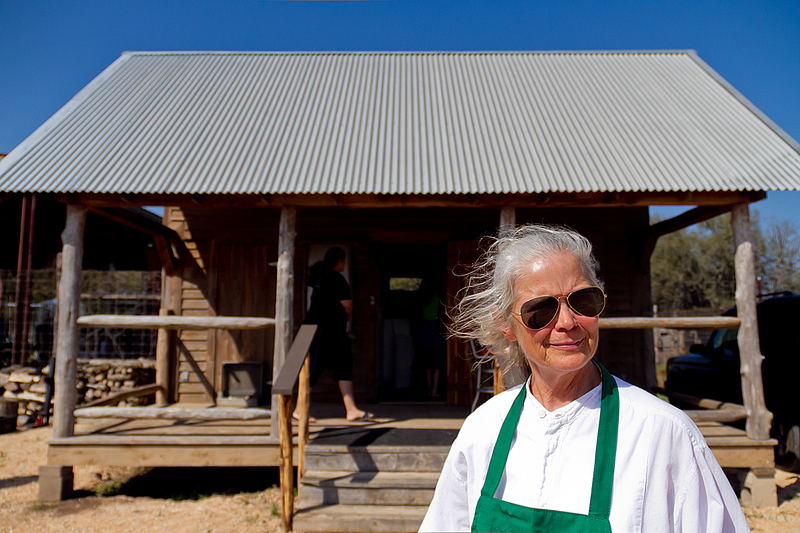 In fact, it was due to Chef Galvan that Brian came to the Michaelis Ranch. About a year ago, Chef introduced Brian to Sharon Michaelis knowing that Sharon was looking to start a farmers market. They instantly worked out a program where Brian would tend to a garden on the ranch and it's worked out wonderfully for everyone, including our guests who get to enjoy the fresh locally grown produce. The 150 market has a great selection of local vendors. You can find locally raised lamb, fresh honey, organic hummus and even our very own "Mom's Beef Lasagna", made by Chef Galvan, and includes beef raised right on the Michaelis Ranch. 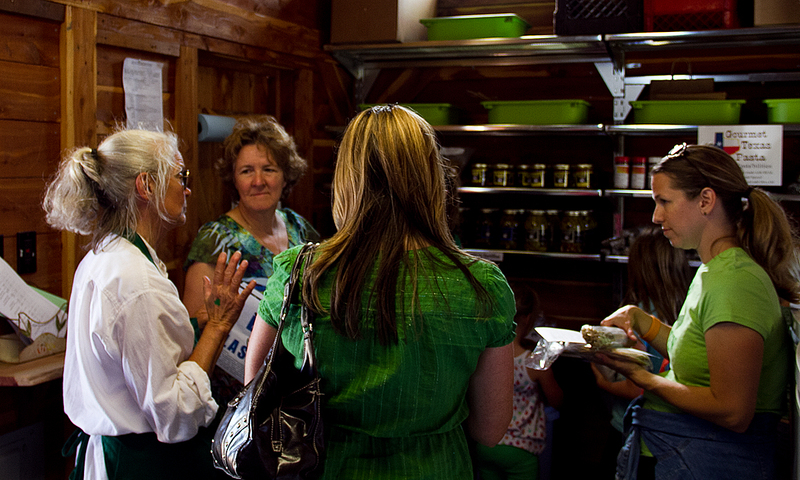 Here you can see Sharon Michaelis talking with market guests in the cabin. If you're visiting the Inn Above Onion Creek on a Thursday be sure and stop and see the dozens of local vendors offering sustainable and locally produced products. 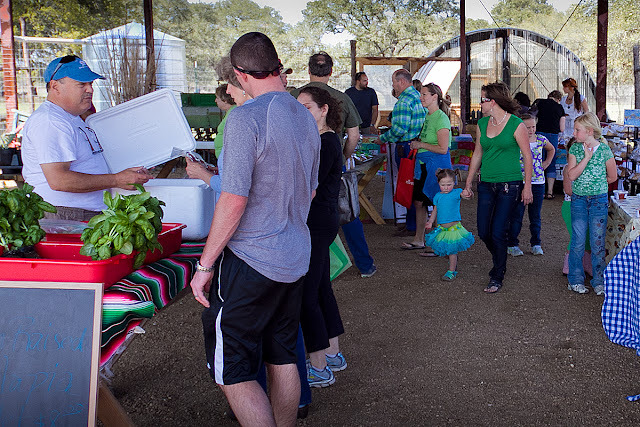 The 150 market takes place on Saturdays from 1-4pm at the Michaelis Ranch.